Eye of mongrel dog with strong tapetal reflex. The tapetum lucidum /təˈpiːtəm/ (Latin: "bright tapestry; coverlet", plural tapeta lucida) is a layer of tissue in the eye of many vertebrates. Lying immediately behind the retina, it is a retroreflector. It reflects visible light back through the retina, increasing the light available to the photoreceptors (although slightly blurring the image). The tapetum lucidum contributes to the superior night vision of some animals. Many of these animals are nocturnal, especially carnivores, while others are deep sea animals. Similar adaptations occur in some species of spiders. Most primates, including humans, lack a tapetum lucidum, and compensate for this using perceptive recognition methods. Presence of a tapetum lucidum enables animals to see in dimmer light than would otherwise be possible. 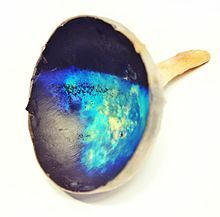 The tapetum lucidum, which is iridescent, reflects light roughly on the interference principles of thin-film optics, as seen in other iridescent tissues. However, the tapetum lucidum cells are leucophores, not iridophores. The tapetum lucidum functions as a retroreflector which reflects light directly back along the light path. This serves to match the original and reflected light, thus maintaining the sharpness and contrast of the image on the retina. The tapetum lucidum reflects with constructive interference, thus increasing the quantity of light passing through the retina. In the cat, the tapetum lucidum increases the sensitivity of vision by 44%, allowing the cat to see light that is imperceptible to human eyes. It has been speculated that some flashlight fish may use eyeshine both to detect and to communicate with other flashlight fish. 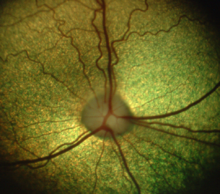 Retinal tapetum, as seen in teleosts, crocodiles, marsupials and fruit bats. The tapetum lucidum is within the retinal pigment epithelium; in the other three types the tapetum is within the choroid behind the retina. The functional differences between these four different types of tapeta lucida are not known. Eyeshine is a visible effect of the tapetum lucidum. When light shines into the eye of an animal having a tapetum lucidum, the pupil appears to glow. Eyeshine can be seen in many animals, in nature and in flash photographs. In low light, a hand-held flashlight is sufficient to produce eyeshine that is highly visible to humans (despite our inferior night vision). Eyeshine occurs in a wide variety of colors including white, blue, green, yellow, pink and red. However, since eyeshine is a type of iridescence, the color varies with the angle at which it is seen and the minerals which make up the reflective tapetum-lucidum crystals. Although human eyes lack a tapetum lucidum, they still exhibit a weak reflection from the fundus, as can be seen in photography with the red-eye effect and with near-infrared eyeshine. Another effect in humans and other animals that may resemble eyeshine is leukocoria, which is a white shine indicative of abnormalities such as cataracts and cancers. Cats and dogs with a blue eye color may display both eyeshine and red-eye effect. Both species have a tapetum lucidum, so their pupils may display eyeshine. In flash color photographs, however, individuals with blue eyes may also display a distinctive red eyeshine. Individuals with heterochromia may display red eyeshine in the blue eye and normal yellow/green/blue/white eyeshine in the other eye. These include odd-eyed cats and bi-eyed dogs. The red-eye effect is independent of the eyeshine: in some photographs of individuals with a tapetum lucidum and heterochromia, the eyeshine is dim, yet the pupil of the blue eye still appears red. This is most apparent when the individual is not looking into the camera because the tapetum lucidum is far less extensive than the retina. Humans use scanning for reflected eyeshine to detect and identify the species of animals in the dark, and deploying trained search dogs and search horses at night, as these animals benefit from improved night vision through this effect. Traditionally it has been difficult to take retinal images of animals with a tapetum lucidum because ophthalmoscopy devices designed for humans rely on a high level of on-axis illumination. This kind of illumination causes a great deal of reflex, or back-scatter, when it interacts with the tapetum. New devices with variable illumination can make this possible, however. ^ "Latin Word Lookup". Archives.nd.edu. Retrieved 2014-03-20. ^ a b Locket NA (July 1974). "The choroidal tapetum lucidum of Latimeria chalumnae". Proceedings of the Royal Society B. 186 (84): 281–90. doi:10.1098/rspb.1974.0049. PMID 4153107. Retrieved 2008-09-12. ^ GUNTER R, HARDING HG, STILES WS (August 1951). "Spectral reflexion factor of the cat's tapetum". Nature. 168 (4268): 293–4. doi:10.1038/168293a0. PMID 14875072. ^ a b c Ollivier FJ, Samuelson DA, Brooks DE, Lewis PA, Kallberg ME, Komáromy AM (2004). "Comparative morphology of the tapetum lucidum (among selected species)". Vet Ophthalmol. 7 (1): 11–22. doi:10.1111/j.1463-5224.2004.00318.x. PMID 14738502. Archived from the original on 2013-01-19. Retrieved 2008-09-12. ^ Denton, EJ; Nichol, JAC (1964). "The chorioidal tapeta of some cartilaginous fishes (Chondrichthyes)" (PDF). J. Mar. Biol. Assoc. U. K. 44: 219–258. doi:10.1017/S0025315400024760. Archived from the original (PDF) on 2012-03-22. Retrieved 2011-09-12. ^ Wagner HJ, Douglas RH, Frank TM, Roberts NW, Partridge JC (January 2009). "A novel vertebrate eye using both refractive and reflective optics". Curr. Biol. 19 (2): 108–14. doi:10.1016/j.cub.2008.11.061. PMID 19110427. ^ Ankel-Simons, Friderun (2007). Primate Anatomy (3rd ed.). Academic Press. p. 375. ISBN 978-0-12-372576-9. ^ Lee, Henry (1886). "On the Tapetum Lucidum". Med Chir Trans. 69: 239–245. doi:10.1177/095952878606900113. PMC 2121549. PMID 20896672. ^ Forrest M. Mims III (2013-10-03). "How to Make and Use Retroreflectors". Make. Retrieved 2017-10-21. ^ Rainer F. Foelix (1996). Biology of Spiders, 2nd ed. Oxford University Press. pp. 84–85. ISBN 978-0-19-509594-4. ^ Cohen, Gerald D. (1986). Target organ toxicity. Boca Raton: CRC Press. pp. 121–122. ISBN 978-0-8493-5776-3.